Best seen in large size. D700 ISO 4000 f5.6 1/25 sec hand held. 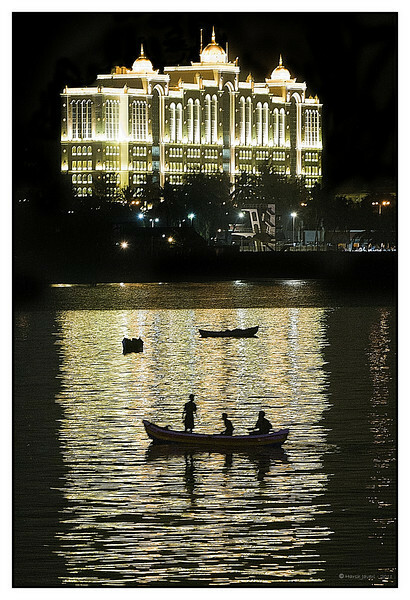 Saifee Hospital was built by Dawoodi Bohra leader Mohammed Burhanuddin and was lit up on his 100th birthday last week. Mohammed Burhanuddin Syedna is the 52nd Dā‘ī l-Muṭlaq (Dai, or Unrestricted Missionary) of the Dawoodi Bohras. The Dawoodi Bohras are a sub group within the Mustaali, Ismaili Shia. Spectacular! I like the reflection and silhouette of the men in the boat. Wonderful night shot - love the colors...or lack thereof! Very nice composition & framing, exposure, lines & textures, overall feeling in this one. I stared at this one for awhile.